AR Tetrobol (2.37 g, 14mm, 11). In the name and types of Philip II of Macedon. Diademed head of Apollo right. right; in exergue, spearhead right. 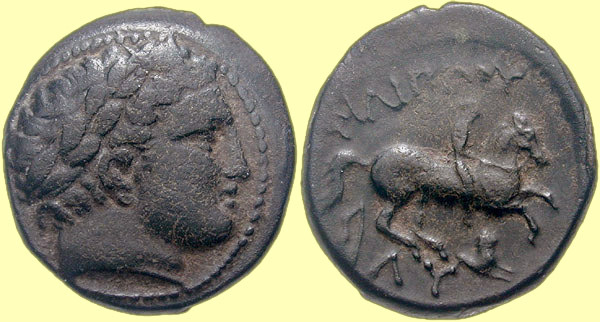 Pedig: Ex Classical Numismatic Group 63 (21 May 2003), lot 270. AR Tetrobol (2.35 g, 14mm, 1). In the name and types of Philip II of Macedon. right; in exergue, grain ear right. Müller -; AMNG III/2, -. Æ Double Unit (7.08 g, 17mm, 4). In the name and types of Philip II of Macedon. Horseman riding right; below, ΛY and forepart of lion right. Æ Unit (4.20 g, 17mm, 12). In the name and types of Philip II of Macedon. SNG ANS 997 (Philip II); Price P4. Æ Half Unit (2.23 g, 15mm, 6). In the name and types of Philip II of Macedon. Horseman riding right; below, ΛY and facing head of lion. Æ Unit (5.27 g, 18mm, 12). In the name and types of Philip II of Macedon. AR Tetrobol (2.30 g, 14mm, 3). In the types of Philip II and name of Alexander III of Macedon. to right, trident head right. AR Diobol (1.22 g, 11mm, 1). In the types of Philip II and name of Alexander III of Macedon. 41 (18 June 1970), lot 51 (same rev. die). 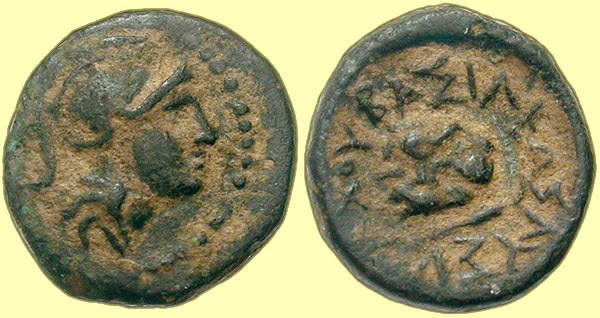 Pedig: Ex G. Hiller Collection (Elsen 94, 15 December 2007), lot 155. Æ Unit (5.17 g, 18mm, 11). In the types of Philip II and name of Alexander III of Macedon. ander IV); SNG ANS -; Price 437. AR Tetrobol (2.64 g, 15mm, 6). In the types of Philip II of Macedon. no spearhead? ); SNG ANS -; Price -. Notes: This amazing specimen was struck from a reverse die that was originally engraved with the ΛY below the horse and ΦΙΛΙΠΠΟΥ above (Thompson 1). While the traces of the latter are barely discernable, the former is clearly visible in the field below the horse's belly. This confirms that the Thompson 1 types were followed by the Thompson 3 types, of which this coin is a variety. Two other specimens with a reengraved reverse die are BMFA 821 and Leu 48 (10 May 1989), lot 100 (both from the same reverse die, with a grain ear in the exergue and no spearhead). AR Tetrobol (2.46 g, 14mm, 8). In the types of Philip II of Macedon. spearhead? ); SNG ANS -; Price 434. AR Tetrobol (2.43 g, 14mm, 1). In the types of Philip II of Macedon. forepart of lion right right. Ref: Thompson 3; Müller -; AMNG III/2, -; SNG ANS -; Price 434A. Æ Unit (4.99 g, 17mm, 3). In the types of Philip II of Macedon. Horseman riding right; below, forepart of lion right. Æ Unit (3.23 g, 17mm, 12). In the types of Philip II of Macedon. Horseman riding right; ΛY behind, forepart of lion right below. Winterthur 1306e/1589 (same obverse die). 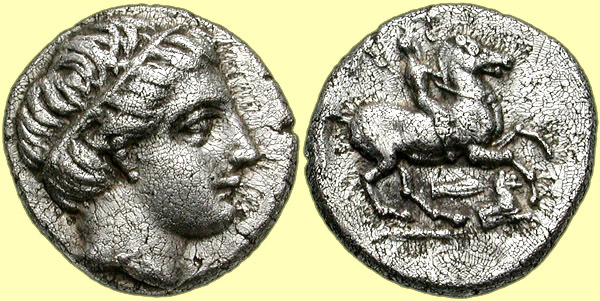 AR Drachm (4.20 g, 20mm, 12). Athena Nikephoros seated left; to inner left, bee between E-Φ. Ref: Thompson 168; Müller 421; SNG Copenhagen 1147. 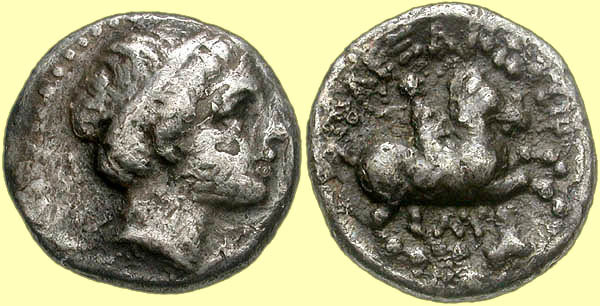 Notes: Ephesos was one of the primary drachm mints of Lysimachos. Captured circa 295 BC, he renamed Epesos Arsinoe, in honor of his wife. 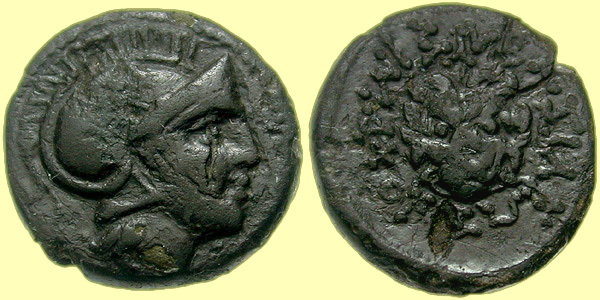 The mint stopped production circa 287 BC, when Magnesia attacked many of its rival cities after Lysimachos' control in Ionia weakened after Demetrios Poliorketes invaded there. Although Lysimachos reestablished control in Ionia, he apparently did not reopen most of the mints, having shifted production to his mints in more secure regions. Æ 12mm (1.94 g, 5). Ref: Müller pl. XLII, 12; SNG Copenhagen 1170. Notes: This coin type is likely the next larger denomination after the coin below. Æ 9mm (0.69 g, 5). Head of lion right; below, spearhead(?) right. 1992), lot 152, otherwise unpublished. Notes: Other than the Tronnier example, this small bronze is completely unpublished. 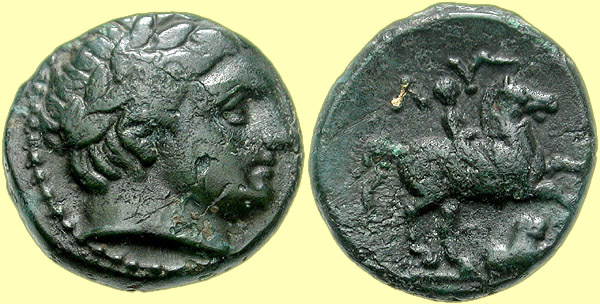 It is the smallest known coin of Lysimachos, and approximately 2/3 the weight of the smallest published bronze coins (11mm bronzes; cf. SNG Copenhagen 1158). 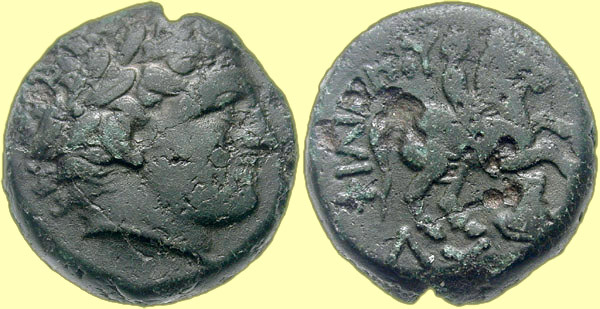 This coin is most similar to an 11mm bronze coin of Lysimachos which has the same types, but the reverse has a facing lion's head (SNG Copenhagen 1170; see previous coin above). The three published examples of that type are approximately twice the weight of this coin, and as such, it is likely that these tiny coins are associated fractions of those coins.